so if you have a car with a factory tinted glasses,its advisable that you apply for a tinted permit to avoid embarrassment. If you are driving a car with tinted windows without a tint permit, you can be pulled over and your vehicle will be impounded apart from that you may even be required to pay a fee. This article contains steps to obtain your tinted glass permit in Nigeria easily. Q1: How do I get a tinted glass permit in Nigeria? Follow below steps below to get your tinted permit. 3. You will be provided with a login password (you can change it once you log in). 4. Scan proof of ownership and drivers license. 6. Press submit and print out the page. 7. Take the print out form to police state headquarter in your area. 8. Tender your print out and you will be captured both face and finger print,(biometrics) probably in the ICT department,you can ask the officers you see there for direction to the ICT department. 9. A copy of your print out form with an inscription : UNDER PROCESSING WITH SIGNATURE AND DATE will be giving back to you. 10. You can log in to your portal regularly to monitor and see if your permit has been approved. Q2: What is the cost of tinted glass permit in Nigeria? 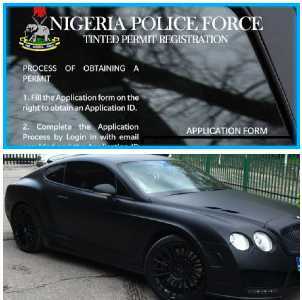 Tinted permit is usually issued for free,judging from what was written on their official website,however they may ask you to pay within N20,000 - N30,000 Naira for a tinted glass permit. Q3: Can a vehicle with a non factory fitted tinted windows obtain a tinted permit in Nigeria? No, tinted permit is only issued to vehicles with factory fitted tinted windows. Q4: What is nimc number for tinted permit? The full meaning of nimc is National Identity Management Commission (NIMC) and was introduced by their National Identification Number (NIN). The National Identity Number or NIN is the actual name of the NIMC number,and It is a unique number that is assigned to every person for the rest of their life. NIN is an 11 digits long number and a proof of your identity as a Nigerian. NIN contains coded,classified information about you, like all of your fingerprints, your photo (head to shoulders), your demographics and personal digital signature. NIN is required when filling important documents like tinted permit Etc for proper identification. To get your own NIN number just visit one out of 36 NIMC Registration Centers in Nigeria, where you will have to provide your fingerprints, demographics, a digital signature and a photograph. After your registration, your data will be stored in the NID, and you will receive your NIN. I applied for tinted permit since late 2016 precisely in October and uptill now it has not been approved just check now and the police are harassing me. please what can i do? Does it also apply to vehicles tinted at the back only and not the drivers/passengers glass?